Como bajar la temperatura del procesador de tu portátil, evitar calentones!!! Con el calor de esos dias y con la que nos espera en los próximos meses a nosotros y a nuestros queridos portátiles…. en DondeRepararPortatil.com hemos pensado que te puede venir bien tener controlada la temperatura de funcionamiento del procesador de tu portátil, Core Temp es una pequeña aplicación, pero potente para monitorizar la temperatura de cada nucleo del procesador de su equipo. Este artículo lo hemos visto en auyanet.net, gracias amigos!!! El usuario puede indicar en milisegundos la frecuencia de actualización del programa. Si desea o no que Core Temp le avise cuando la temperatura alcance niveles peligrosos. Conocer más datos sobre el procesador de su equipo. Core Temp trabaja independientemente de su placa base gracias a la integración de la nueva tecnología “DTS” (Digital Thermal Sensor) en los nuevos procesadores. El DTS proporciona la más precisa información de temperatura de su micro, mucho más que los sensores convencionales. Esta función es compatible con todos los procesadores x86 recientes. Compatibles con los procesadores de Intel, AMD y VIA. Es fácil de usar, permitiendo al mismo tiempo un alto nivel de personalización y capacidad de expansión gracias al soporte de plugins. Nota: Lista de procesadores compatibles. Quieres saber mas de como funciona CoreTem. How does it work? Core Temp makes it easy for you to monitor the temperature of any modern x86 based processor. The program supports processors from all three major manufacturers; Intel, AMD and VIA. Intel processors starting with the “Core” series all the way up to the newest Core i7, including all the derivatives. AMD processors starting with the first Athlon64 and Opteron processor series, all Phenom and AMD’s new APU are supported. VIA processors starting with the C7 generation of CPUs, including all the derivatives based on the C7 architecture. All of the Nano based processors are supported as well. The temperature readings are very accurate as the data is collected directly from a Digital Thermal Sensor (or DTS) which is located in each individual processing core*, near the hottest part. This sensor is digital, which means it doesn’t rely on an external circuit located on the motherboard to report temperature, its value is stored in a special register in the processor so that software can access and read it. This eliminates any inaccuracies that can be introduced by external motherboard circuits and sensors. Intel defines a certain Tjunction temperature for the processor. This value is usually in the range between 85°C and 105°C. In the later generation of processors, starting with Nehalem, the exact Tjunction Max value is available for software to read in an MSR (short for Model Specific Register). A different MSR contains the temperature data. The data is represented as a Delta in °C between current temperature and Tjunction. The size of the data field is 7 bits. This means a Delta of 0 – 127°C can be reported in theory. In fact the reported temperature can rarely go below 0°C and in some cases (Core 2 – 45nm series) temperatures below 30° or even 40°C are not reported. AMD processors report the temperature via a special register in the CPU’s northbridge. Core Temp reads the value from the register and uses a formula provided by AMD to calculate the current temperature. The formula for the Athlon 64 series, early Opterons and Semprons (K8 architecture) is: ‘Core Temp = Value – 49′. For the newer generation of AMD processors like Phenom, Phenom II, newer Athlons, Semprons and Opterons (K10 architecture and up), and their derivatives, there is a different formula: ‘CPU Temp* = Value / 8′. CPU Temp is because the Phenom\Opteron (K10) have only one sensor per package, meaning there is only one reading per processor. 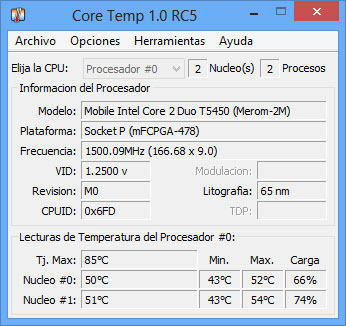 VIA processors are capable of reporting the temperature of each core. The thermal sensor provides an absolute temperature value in Celsius, there is no need for any conversion or manipulation. The Tjunction or TjMax temperature on VIA chips is usually between 70 and 90C. 90C for the mobile and low power versions and 70C is for the desktop variants.